ALEXANDRIA, Virginia (CNN) -- Jurors in the corruption trial of former U.S. Rep. William Jefferson of Louisiana ended their second day of deliberations without a verdict Friday, said a spokesman for the U.S. attorney's office in Alexandria, Virginia. 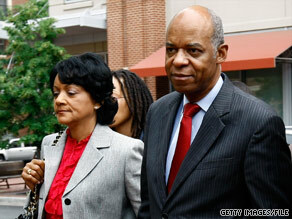 Ex-U.S. Rep. William Jefferson and his wife, Andrea, arrive at court last month in Alexandria, Virginia. A federal grand jury indicted Jefferson on on corruption charges June 4, 2007, about two years after federal agents said they found $90,000 in his freezer. Authorities said the cash was part of a payment in marked bills from an FBI informant in a transaction captured on video. Closing arguments by defense and prosecution attorneys ended Wednesday. The jury of eight women and four men deliberated for about 3½ hours Thursday and 5½ hours Friday, said Peter Carr, spokesman for the U.S. attorney's office. The trial began June 16. The jury will resume deliberations Monday morning. Jefferson, 62, was indicted on charges of using his congressional clout between 2001 and 2005 to solicit and receive hundreds of thousands of dollars in bribes for himself and his family in exchange for promoting products and services in Africa, especially Nigeria, and elsewhere. The Democrat pleaded not guilty to 16 counts of racketeering, money laundering, wire fraud, obstruction of justice and violations of the Foreign Corrupt Practices Act. Carr said Jefferson could face a maximum sentence of up to 235 years in prison if convicted. The information on the refrigerated cash, discovered in Jefferson's Washington home in August 2005, was revealed in an affidavit used to obtain a warrant to search Jefferson's office in May 2006. Descriptions from the heavily redacted affidavit and pictures of the open freezer show bills wrapped in foil and tucked into frozen food containers, including a box for pie crusts and another for veggie burgers. FBI agents told a judge that the money was part of a $100,000 payment that had been delivered by an informant in the bribery investigation, which led to guilty pleas by a Kentucky businessman and a former Jefferson aide. Jefferson contested the office search before the Supreme Court, contending that he should have been afforded a chance "to segregate privileged legislative materials and shield them from review" before the search warrant was executed. The court refused to settle the dispute. Jefferson, who graduated from Harvard Law School, represented Louisiana's 2nd Congressional District, which includes most of the New Orleans area. He held office for 18 years, or nine terms, before he lost his House seat in a December election. As representative, he served on the House Ways and Means Committee's subcommittee on trade and on the Budget Committee, and he co-chaired the caucus on Africa Trade and Investment as well as the caucus on Nigeria.